Let’s have an honest talk about women and working in tech sales. 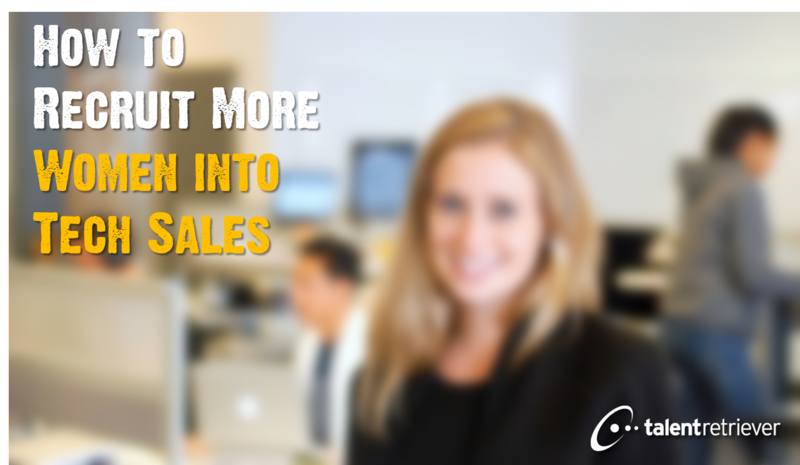 When you look at the facts – only 25% of salespeople in tech companies are women. When you look at your sales floor, are you lacking a female presence that would open the doors for having an inclusive, diverse sales team? There might not be a more perfect time than right now to stop and think about what you can do to get more women interested in your company and recruit them to be on your sales team. Here are 3 ways to do so. It’s universal for everyone – you want to know how you will progress within a company. It’s perhaps the most make or break part of choosing an employer. The trouble is only 12% of salespeople in leadership roles in tech companies are women, meaning there isn’t a lot of proof of career progression. When you look at common industries that saleswomen do work in – retail, fashion, cosmetics, you’ll find that there are clear examples of women being able to progress their careers within those industries. They’re able to see for themselves a process, and a clear path. If you have a female sales leader or a number of them, allow them to be front and center to women that are in the recruiting process. Have them meet the candidates, get to know them and have them be an ambassador for the team. If you don’t have a strong female presence in a sales leadership role, that is clear reason as to why having women on the sales team for the long term is so important – creating increased potential for leadership roles and creating a positive cycle. And we’re not just talking about one day a year career fairs. Instead, strive to have a consistent presence all year long. Women make up 56% of the collegian population. Building a relationship with students before they enter the work force is critical. Your company should develop close ties to the Career’s offices of local colleges, being top of mind to student advisors when it comes to internships and entry level sales positions. Also, have the sales leaders hold discussions and seminars on campus, discussing career progression in sales and tools to be a great professional. Look to partner with organizations that focus on inclusion and diversity. For example, She Geeks Out is an awesome organization in Boston that provides knowledge, skills, and tools for creating an inclusive environment and does so through networking events throughout the year. Sponsoring an event and welcoming an organization like this into your offices opens the opportunity for dozens of potential saleswomen to feel welcomed and eager to learn more about your company. Look, beer kegs and ping pong are awesome things to have at a company and many women are as psyched as anyone to spike a ball at the intern to close out a game. But at the same time, featuring culture shaping amenities at the company that appeal to other groups is key. Stuff like a wine selection to accompany the beer cart or an area that’s more focused on relaxation like a yoga area. After all, these things are to help clear your mind for a few minutes and escape from the grind, sometimes competition isn’t what you always want to do. Which by the way, doesn’t just appeal to women. Many men would enjoy these things too, and would enable more complete inclusion and less idea of a divide. This stuff is especially key in those early stages of someone’s time at a company, when they are getting their footing and getting comfortable. At the end of the day, it’s all about inclusion. Building the best sales team possible, and by having more women involved, you are introducing new approaches, ideas and perspectives that instrumental in the sales process.